Our David Seifert, Aaron Fitt and Kendall Rogers will be here to answer your draft and prospect questions at 2 PM ET. Hey guys, let’s talk some prospects. We currrently see Conine as a low 2nd round to top of the 3rd round pick. However, he’s a college bat and those types have a lot of helium once ML team’s draft meetings begin. Although he’s had a pretty disappointing junior season, where do you think Griffin Conine will end going in the draft? We currently see Conine as a low 2nd to top of the 3rd round pick. However, he’s a college bat and those types have a lot of helium once ML team’s draft meetings begin. You failed 2 list 2 of the top players in the Pac12 and on the west coast- Jonah Davis of Cal and Joe DeMers of UW. Both are putting up All-American type numbers and have a skill set to succeed at the next level. Can you see either getting on this list by season’s end? I have not seen Jonah, but plan to when Cal rolls into Stanford in a couple of weeks. I’ve heard that he can hit, but has a fringy arm behind the plate. In regards to DeMers, I saw him in Week 3 in Minnesota, the weekend after his perfect game and he was impressive. If we went another 25 prospects deep from the 150, he would have been considered. Am I being too optimistic trying to convince myself (and others) that Brett Kinneman will be a first round draft pick? You know, I think there’s a real chance he could play his way into the first round if he continues to perform at such a high level in the second half. He’s got legitimate tools — really good power, solid speed, solid arm, pretty swing — and he has performed for three years. I think scouts right now view him as a 2-4 round type, but I think plenty of them are waiting to see if he can sustain this crazy-high performance. If he does, don’t be surprised if he jumps into the back of the first round. Do you see any possibility of Robert Neustrom climbing higher than the 4th round where you guys have him? Yes, for sure. He could easily end up in the 3rd round. Hitters typically rise on draft day, especially after all the prospect medicals have been reviewed by team doctors. Usually the pitchers fall, the hitters rise. Hey guys, how far was Kole Cottam off the midseason 150? Great season with the bat so far. If we had a Just Missed list, Cottam would have been on it. He should go within the top 10 rounds. Where do you see Greyson Jenista ending up in the draft, and where do you think he ends up playing in pro ball? I think Jenista’s value is similar to Kinneman’s — probably fits in that 2-3 round range, with a chance to sneak into the back of the first. Ultimately I think Jenista will wind up on a corner, but I think he’ll hit for enough power at a corner to profile there, and his ability to play some center field gives him added value. The big question is whether Jenista’s hit tool will play; some people have doubts about his swing. I’m personally higher on Jenista than David is, for instance. If India and Liput decide to declare for the draft, where do you see them being graded at? 1st-5th round at all? If that’s the case, they be gone 100%. Players do not “declare” for the baseball draft. Both India and Liput are eligible since they are college juniors. If/when they are selected, they either sign professionally or return for their senior year. For me, India is a top 10-15 overall pick. Liput should go in the top 10 rounds and was considered for our Top 150. Do you anticipate Tyler Holton being drafted high enough or being offered enough money to entice him to sign or do you think he will be back at FSU next season? Thanks! My hunch is he’ll be back for another season. He can obviously really, really pitch, but it’s not like he has overwhelming stuff, so I have a hard time thinking a club is going to pay him enough to sign when he’s missed the whole season with Tommy John surgery. You never know, of course — I don’t know what Holton’s price tag is, and maybe he’d be willing to sign for less if he just wants to get his pro career started. But I’d bet on him returning. Before the season there was draft chatter for Hogan Harris and Nick Lee. Are those guys still on radars or has lack of team success and injuries (Harris)/inconsistency (Lee) reduced their value? Cajuns — We actually debated Harris and Lee quite a bit. The thing about Harris is he’s still a good looking lefty who can run it up into the mid-90s. He also has a nice breaking pitch. Now, I’d like to see the nagging injuries stop, but there’s no doubt the pieces are there, and you can bet a team will take a chance with a decently high pick on a lefty with that kind of juice. As for Lee, I am very high on him. He showed 92-95 for me in Houston earlier this year, along with a filthy changeup from a tough angle. Both should be strong picks, even with the team’s struggles. With how he’s pitched so far, do you think Michael Plassmeyer of Missouri could hear his name called in the first 10 rounds of the MLB Draft? Yes, without a doubt. He has the stuff, command and his #s are loved by analytics departments. You guys seem to be easily the high ones on Singer. I know you can’t speak for the way others rank, but with his stuff being down this spring, that doesn’t cause for any concern? I don’t think I agree with the notion that Singer’s stuff is down. I mean, he’s not popping 97s like he has in the past in a relief role, but he still pitches pretty comfortably at 92-95 with explosive life, and his slider is still a quality out pitch that he manipulates well. It’s pretty much the same stuff we’ve seen from him in the past. I think people are being a little too nitpicky with Singer; it’s an electric fastball from a tough slot, a swing-and-miss slider, and he’s a mean SOB out on the mound. I get that some people are concerned about his delivery, or the fact that he failed a physical out of high school, or maybe the fact that he doesn’t really use his changeup much… but if he drops outside the top 10 picks, I think whoever takes him is getting a steal. I read the intro! So, who are some of the players that you were higher on than the industry? Lower? Higher than the industry on India, Hannah, Mangum, Byrne and Rivas to name just a few. Lower on Conine, Kingham, Shugart. Personally, I’m lower on Jenista as well. Do you think Texas tech’s Davis Martin can be a 1st round draft pick in his senior season? TTU — No, because I don’t think there’s much of a chance he returns for another season. I could see it with Gingery, though, I would certainly bet that he’ll sign. But as for Martin, he’s having a huge year and is showing premium stuff. He really has nothing else to prove at the collegiate level, and he’ll get drafted the top two or three rounds. 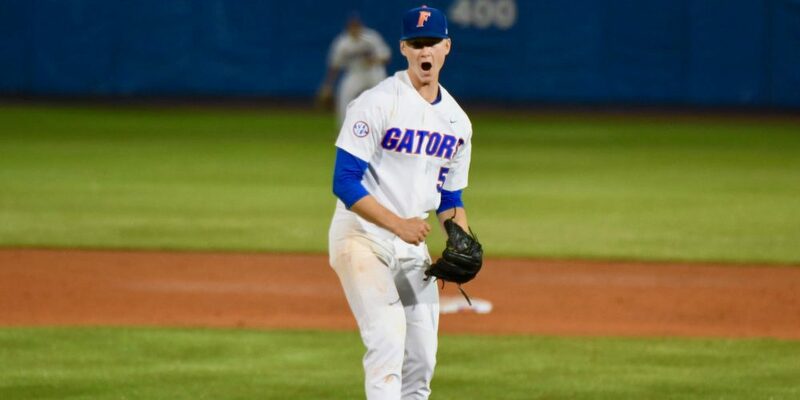 What do you think Tanner Dodson is at the next level a pitcher or an outfielder? I saw him last summer in the Cape, and I would have leaned hitter. I have not seen him this spring, but will in a couple weeks at Stanford. Hope to have a better answer for you at that point. Bergner’s a tricky case. Obviously he’s got stuff — last time I saw him against Florida State, it was 91-94 and up to 96, with a changeup that regularly flashed plus and a promising curveball that came and went. Problem is scouts really don’t like his arm action, which leads to inconsistent command and raises concerns about his long-term durability. And he’s an eligible sophomore, which means he has plenty of leverage… ultimately I suspect he’ll wind up getting drafted in the 3-4 round range and sign, but you never know. I wouldn’t be entirely shocked if he winds up coming back for his junior year. Where do you see Josiah Gray’s ceiling? Up to 97 and performed well on the cape and in school. NY — We’ve heard good things. I talked to a crosschecker the other day who saw him at 90-94 and up to 95. He’s a reliever for most scouts right now, so there’s only so much room for guys like that. But he’s on our radar and we will circle back around in our final rankings before the draft. Any skepticism on India, given his relatively ho-hum first two seasons (despite a great pedigree)? Do you think those years will be held against him on draft day, or is this what he is? Cole is one of my personal favorite prospects in college baseball right now, a guy that I probably value more than the industry as a whole. I think he probably will be drafted in the 4-5 round range, but personally I like him better than that. He’s got a really good all-around tool set, a switch-hitter with a nice, compact stroke, solid pop, good control of the strike zone, good speed, a strong arm and excellent defensive skills — he’s like a “cheap” five-tool player, I think. I bet he’ll have a nice, long big league career. What are your thoughts on the Nebraska’s Scott Schreiber? A guy who seemed to be fairly high on draft boards after his So campaign, suffered a inconsistent Jr year, elected to return for his Sr season, and is proving his So year wasn’t a fluke. As a senior, Schreiber is a likely top 10 round pick. Power potential for a team friendly signing bonus. Sprengel is just such a wild card, given his unexpected bout of serious wildness as a junior. Obviously he has pedigree, arm strength and he’s lefthanded… but right now nobody really knows what to make of him. Maybe somebody takes a chance on him in the top five rounds and hits the lottery, or maybe he slips later than that. Have any of you seen Tyler McKay play? I watched every inning he pitched at Kansas State his freshman year and I would never peg him as a top 10 round pick let alone a top 4 round. What has changed? Sometimes a change of scenery brings out the best in people. He’s 88-92 with projection for more. Throws strikes and has breaking ball. A lot to like with his 6’6 frame. How far away was Notre Dame’s Nick Podkul from cracking this list? Strongly considered for our Top 150. Just missed it, in fact. First mock I’ve seen with players like Hannah and India so high and guys like Jenista so low. Personally, I think Jenista/India are absolutely first round guys, but not Hannah. Just to clarify, this isn’t a mock — we’re not trying to predict where players will be drafted. This is just how we rank them based on talent. And we recognize that we’re probably higher than the industry consensus on Hannah, and perhaps lower than the industry consensus on Jenista. I addressed Jenista earlier; as for Hannah, how is he so different from Corey Ray, who was a top-five overall pick? He’s a favorite of both Seif and Rogers. Love your chats, guys! Is D2 Catcher Peyton Isaacson the most under-rated player in college? Not sure if it’s because he’s at a D2 school (Saint Leo), but he’s going off, yet not I never hear his name. Hitting .367/.443/.742 with 11 HR, 39 RBI, 15 2b. Also 10/10 SV as team’s closer. I go to all of their home games and starting to see more and more scouts. Is he finally getting some love?? Peyton was a highly rated HS prospect from the area in which I live. It didn’t work out for him at Coastal Carolina. One of my best coaching friends is the HC at Saint Leo. He has great things to say about Peyton, but I just haven’t seen him play since HS. Wish I had more to give you. Glad scouts are starting to take notice. Why so low on Jenista? I have no real credentials, but view him as a top-25 overall pick. I will take the blame for Jenista being so low. My partners, Aaron and KR both value him more. I do think he’s a top 3-4 round pick, I simply didn’t buy into the preseason hype of him being selected in the first round, and still don’t. Also, one more guy I personally am extremely high on is Steele Walker. I know he’s ranked 22nd here in an extremely solid list, but given his recent tear could he keep trending up and land as a top-20 overall pick on draft night? It’s certainly possible. There’s nothing set in stone right now, and there’s room for Walker to go up. I was just talking to Skip Johnson this morning about Steele’s recent tear, and he said Walker has changed his swing angle a little bit, and that has produced better and more powerful results. If he finishes the season strong, he absolutely could go up a bit more on the board. What sort of future hit/power grades would put on Larnach? And how much higher is the game power over last year? I don’t think it’s unreasonable to project 55 hit/60 power — and that may be conservative when the dust settles. Everybody seems to like his swing, and it’s easy raw power from the left side, with a great body. He’s made some adjustments since last year that have helped him to tap into that power more, and I think he’s just scratching the surface of his potential. what are your thoughts on Mike Emodi from Creighton? Any buzz for him to get drafted this year. He has lots of power for a catcher and is gunning people down as well behind the dish. Yes, definite buzz. He’s big and strong with good bat strength, but not the best hitting approach. Dead pull hitter with swing/miss…his 31 Ks with only 6 BBs is concerning. Above average arm and fair receiving skills. Round projection on guys like Jeremy Pena or Josh Stowers? We’ve got Pena valued as a sixth-rounder, but I think he could go as high as the fourth or fifth; he’s a good player at a premium up the middle position. We’ve got Stowers as more of a 7-10 rounder, though it’s certainly possible a club out there values him higher than we do. Any pitching prospects from South Florida other than McClanahan for 2018? Hitters as well? I just saw South Florida one game this spring when McClanahan pitched at home vs Tulane. King relieved, I liked him. He was 87-91 with a solid CB. Those are the only two pitchers who threw that night. I also noticed Montes at SS, good tools and some power with swing/miss. Villar at 3B had easy power and at least an avg arm. He might not be a 3B in pro ball, but he has tools/skills to like. Zech could really run, a 70, maybe 80 on the 20-80 scale. Actually hit an inside-the-park HR, fun to watch him fly around the bases. I would be comfortable taking Cate where we have him, maybe a little lower depending upon how he finishes the season and what HS prospects are around him come draft day. We may be a little low on Susi in the 6th round. I saw him the 2nd weekend of the year at SELA. He’s a catcher with a strong arm who has hit, just not for much power. For me, he’s a candidate for a swing path and approach change. Big, strong guy who mostly goes opposite field. Those days are over in the MLB. Lift and pull is in! OK folks, that’s gonna do it for today, thanks for the great questions, as always! No worries, respect your opinion Seif, you’re awesome at what you do and trust your judgement. Thanks Roger. For Greyson’s sake, I hope I’m wrong. It’s just my opinion. What are your thoughts/what have you heard from reports on Robert Neustrom out of Iowa? Neustrom is an overall solid player. No real weakness. Avg arm, avg runner, good raw power. Should be an avg defender in the future on the pro scale. I can’t say I’m a huge fan of his rotational swing, but others may differ, and that’s ok. Doubt he lasts past the 4th round if he continues to perform. He’s always hit at Iowa, as well as in the Cape last summer. ORU Grant Townsend up to 95 potential + slider and changeup. Numbers are good, what’s the draft potential? Thanks for the name, I had not heard it yet. I will be in the Tulsa/Sprinfield/Fayetteville area this weekend and looks like rain on Friday. ORU has the only turf infield among the three. I may run over that way. Thanks for joining the chat guys! You can check out rankings and such, and get the inside scoop on everything prospects and college baseball by subscribing to D1Baseball.com today.